Makeup and beauty !!! 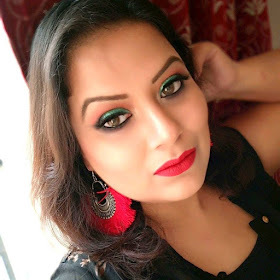 : My Rs.1000/- Make up Challenge ! My Rs.1000/- Make up Challenge ! After posting two tutorials on eye make up,one is on my blog (read here ) other in Purple moments (read here ) blog as a guest post... i got little confident to post my third one...! But i hope you all can see it ! Firstly i applied Keyaseth's Aromatherapy Umbrella powder in my face. Then i applied Maybelline colossal kajal opn upper eyelid as eye liner. Then i slightly blend it with my ring finger or you can do it with a eye shadow brush to give it a smudge look . Now applied the same Maybelline colossal kajal on lower part of eye as kajal. Next i end up my makeup by applying Maybelline hyper curl mascara to my both upper and lower eye lashes. The Final look of my eye makeup ! Next in applied a lip liner from local brand of shade pink . Now i fill the lips with Oriflame floral lipstick in shade soft pink. Finally i end up my whole makeup by applying Keyaseth's Aromatherapy loose shimmer Powder in shade gold. Now Taddda !!! the final looks of mine after the makeup ! Have you took up this makeup challenge yet?...do let me know too,i will love to see yours ! Your comments always encourage me a lot !!! Nice one samannita! Looking pretty! You forgot to put in Preethi's link dear, she is the one who hosted it originally. hey Niesha thanks for your pointing . I rectify that. Your baby is so cute! My son broke my powder! hehehehe.he is very naughty !!! And yes yes my son.he is a spoil brat !!! Hi renji thanks for your comment ! i brought the powders from our local store...it is a famous local brand in kolkata . Great post! I've never before heard of Keyaseth! eyes are looking georg toa! & luk at that cutie pie playing with your stuffs!! !